November is a time to reflect and offer thanks to God for the many blessings we have been given. It is a time to gather around our loved ones in appreciation for the gift of family and for all of the good in our lives. As I reflect on my personal life, I am so thankful for the teachers, friends, parents, siblings, my two children, my five grandchildren, and my wonderful wife of 36 years who have helped guide me into the Man of God I am today. I am also thankful for the Mercy community who welcomed my wife and I with love and compassion eight years ago. This community has reignited my passion for Catholic education which has made the biggest impact of my life. Catholic education provided a strong foundation for me as a student, and later as an adult raising a family. 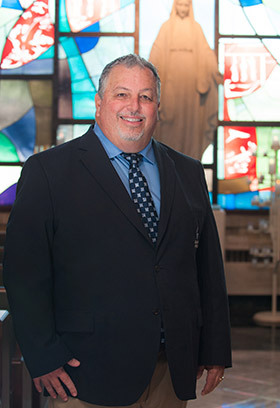 We are truly blessed here at Our Lady of Mercy with a pastor who supports our school, families who are involved and generous, faculty and staff who work tirelessly educating our students in the areas of faith and academia, and students who work each day to better understand their roles in building God's kingdom. My prayers go out to our entire community. I pray that God will bestow onto your families peace and good health. Through words and actions take time to remind your loved ones how special they are. Words in conjunction with actions make the most positive outcomes. During the month of Thanksgiving, be mindful of how you treat others and find mercy in your hearts. I wish you all a happy and restful Thanksgiving break!